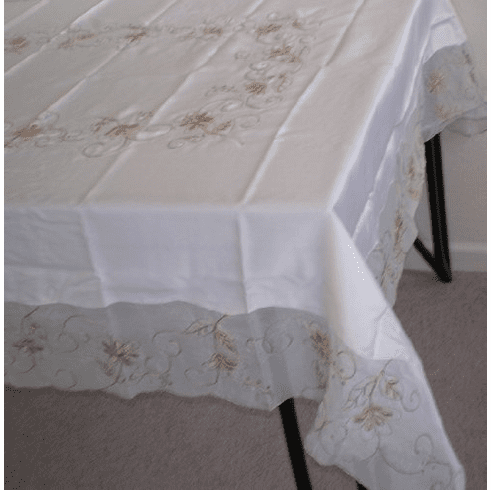 Elegant Artex style embroidery plus trim lace based Table cloth / table cover / table linen 72x90"
Home | Table Cover | Table Linen | Elegant Artex style embroidery plus trim lace based Table cloth / table cover / table linen 72x90"
This is an artex embroidery based Table clothes , the package include one 72x90" . Size: 72x90" is usually for 4-6 chairs table, Please measure your table size to be sure it fit your case. Color: beige background, high quality gold embroidery. The trim lace is very nice. Style: Artex style embroidery plus trim lace based Table cloth / table cover / table linen.